A substantially weakened Italy pushed Germany a full 120 minutes, after which the Germans managed, as the British say, to just about win a penalty shoot-out. While Italy retained the 3-5-2 they have used throughout the tournament, manager Antonio Conte had to deal with significant absences. In the middle of the pitch, he was missing both starter Daniele De Rossi and back up Thiago Motta, injured and suspended respectively. Equally important was the continuing absence through injury of Antonio Candreva, who had been the Azurri’s most effective offensive player in their opening games. In the tournament’s most publicized tactical “surprise”, Joachim Löw switched to a back three, as he had in a friendly against Italy at the end of March. 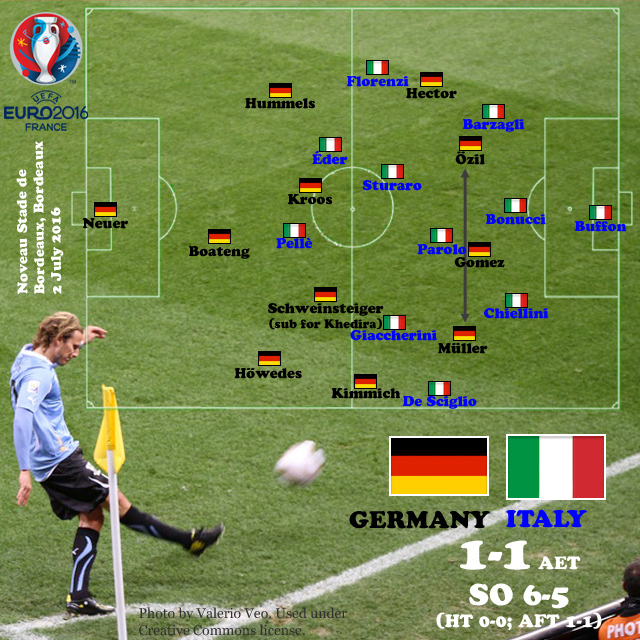 The switch was designed to match Italy in the midfield, which Germany did. Toni Kroos marked Stefano Sturaro and Bastian Schweinsteiger–an early replacement for an injured Sami Khedira–marked Emanuele Giaccherini, with one of the front three dropping onto Italy’s deputized holder, Marco Parolo. Germany also displayed great fluidity in attack, Mesut Özil and Thomas Müller exchanging positions throughout the game. In general, Özil seemed to be the catalyst for the changes, which sometimes involved Mario Gómez (and later Julian Draxler) as well. It’s interesting to compare this fluidity with Portugal’s interchanging attack. In that case, the constant movement of Ronaldo, Nani, and João Mário/Ricardo Quaresma is taken as evidence of the lack of a coherent offensive schema. Arguably, the changes here were more purposeful, given Germany’s relative control of the game. Müller’s best chance, a 54′ shot deflected wide, came as he shifted from the left to the right; and Özil’s goal came about five minutes after he, too, had shifted from left to right, positioning him for the diagonal run to the left post. Or perhaps Germany is just better able to indulge their forwards’ desire to roam. Increasingly over the course of the second half, it appeared that both Özil and Müller wanted to play on the right side, where Schweinsteiger, too, was often joining the attack to target Mattia De Sciglio. Things reached a head at 70′, when Müller, having already been shunted off to the left by Özil a few minutes earlier, wandered back right in hopes of initiating another swap. But Özil remained planted on the right wing, and Müller eventually relented. It was probably not an accident that Julian Draxler, a natural left wing, was introduced at 72′, allowing Müller and Özil to play from the center and right. Credit Löw with understanding how to reshape his side in accordance with his players’ inclinations. Neutral observers benefitted mightily from the failure of penalty-takers in the shoot-out. Most satisfying was Simone Zaza, subbed on in the final seconds of the game so that he could comically shoot over the bar for Italy’s first miss. Not to be outdone, Müller took an easily saved shot, Özil hit the post, and Schweinsteiger skied his effort. Leonardo Bonucci missed, having equalized with a penalty in regulation, and Pellè attempted to upstage Zaza with a comical mishit. It fell to Matteo Darmian, as reluctant a penalty taker as you are likely to see, shooting too close to Neuer for last save. Jonas Hector’s winner was only slightly better, but it slipped under Buffon and the game was over. I am sure it reflects poorly on us as a species, but this comedy of errors was infinitely more satisfying than a string of clinically precise takes. In any event, Germany won the lottery despite Italy having the significant edge of going first. They face today’s winner in the second semifinal next week. Well, Germany was better in the actual game, but they had a string of bad luck, being forced to replace Khedira and Gomez early due to injury and then this freak penalty Italy got when it didn’t look like they were able to score out of the game. I guess it is only fair that they got the luck in the penalty shot-out, even though I have never seen a German national team do that badly in one. (In, they usually win every single time quite easily). It was a crazy penalty for Boating to give up. I think his arms were raised to show he wasn’t fouling Chiellini,but it was definitely strange. Hopefully, the game tomorrow will be a better game all around (notwithstanding Germany’s missing players).